Last edited by Saint of Killers on Wed Nov 25, 2015 5:19 pm, edited 1 time in total. 'Shipments' and 'sales' aren't the same, mate. PS4 has smashed it during Novemer in North America. 1.5 million sold, up from 800k last year. 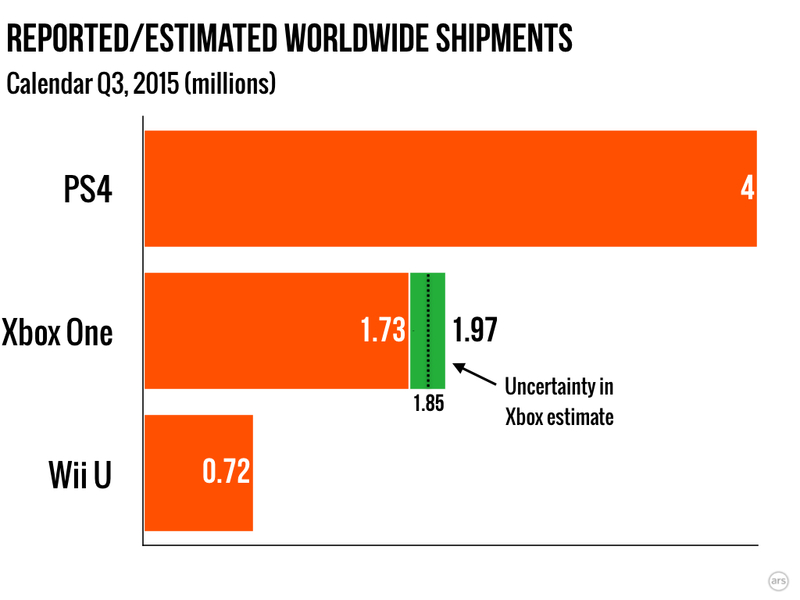 Xbone sold around 1.3 million, a slight increase on last year, while Wii U sold 240k, the same figure as last year. What a turnaround from last gen - sony truly are 4 the players. Last edited by Buffalo on Fri Dec 11, 2015 10:53 am, edited 1 time in total. GrinWithoutaSantaHat wrote: PS4 has smashed it during Novemer in North America. 1.5 million sold, up from 800k last year. Xbone sold around 1.3 million, a slight increase on last year, while Wii U sold 240k, the same figure as last year. So the XBO outsold the PS4 in November 2014? What was the reason for that? christmasforever wrote: What a turnaround from last gen - sony truly are 4 the players. Did you read that before you posted it? They had that big price cut that they said was temporary last November (but then changed their minds when it was time for it to go back up in January). There were some exclusives like Master Chief Collection and Forza Horizon 2, but considering they had some great exclusives this November and didn't sell the most, I'd say it was the price factor last year. So the PS4 was at 30.20m before Black Friday so it is very likely that the PS4 has now outsold the Mega Drive, and could well of outsold the N64. I don't think he ever does. Apparently this is Sony's best November in the US, the previous record being PS2 with 1.4m. It's still amazing when you consider how gash the launch window line-up was. At least it has some games now. Can only imagine what's gonna happen when Uncharted comes out. Next year is all about the playstation exclusives imo and then on top we have those amazing multiplatform titles like dark souls 3 and cd projekts new title. Uncharted 4, the last guardian, no mans sky, the wild, gran turismo sport...the list goes on! About a million a week. Sony's PlayStation Network sales hit 529 million yen which means that PSN generated more revenue than the whole of Nintendo (504m yen). All that money and they still haven't managed to implement two factor authentication. At least there are signs it's finally on the way. I wonder how much longer before it actually becomes available I hope it isn't being held back for the next big update, in which case it won't be made available for a good few months, at the very least. bear wrote: All that money and they still haven't managed to implement two factor authentication. I don't even know what "two factor authentication is", just know it is going to be a Neo exclusive.